One of the most commonly seen skin diseases in the United States is acne. It tends to be more prevalent in teens because of the hormone fluctuations due to puberty but it can affect people of all ages. We looked at the 10 most popular acne treatments on the market and considered their ingredients, number of steps involved in the treatment, cost, how long it takes to see results, skin drying potential, customer experiences and feedback and other considerations. The three acne treatments we have reviewed below are the cream of the crop in all of the categories we considered. Any one of them is a good way to get rid of your bothersome acne for good. Acne most often appears on the face, back and shoulders as well. There are two different types of acne that people suffer from: Inflammatory and Non-inflammatory. Well will explain the differences between the two types in our buyer’s guide following the reviews. There are several things you need to take into consideration when you are looking for the right acne treatment. There are many different types on the market so sorting through them all can be really confusing if you don’t know what you need or what you are looking for. Neutralize Anti Acne Treatment has been proven to improve even severe cases of acne in a few days. The best part is that you don’t need a prescription nor will you have to pay an exorbitant amount to get clear skin. This treatment consists of a three step program that will take care of a multitude of acne problems including whiteheads, acne scars, post acne marks, pimples, cystic acne, psoriasis, and more. This system has a 95% success rate in clearing up even stubborn acne. With a 1% salicylic acid as well as 1% mandelic acid; this product will reduce the appearance of wrinkles, fine lines pores and more so your skin glows and radiates good health. Neutralyze Spot Treatment – This is an important step, as this is what eliminates your acne, corrects skin unevenness, minimizes your pores and reduces the appearance of fine lines and wrinkles. Neutralyze Synergyzer – The job of this step is to improve the complexion visibly and correct your pH balance by enhancing blood flow. 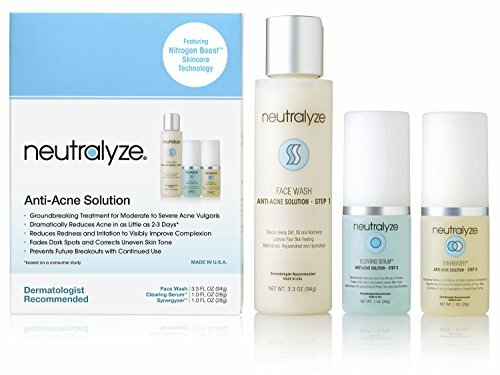 If you’ve tried other over the counter acne treatments with no results, you have to give Neutralyze Acne Treatment a try. Most people that start using this treatment system state that they see significant differences and improvement as soon as 2-3 days after starting the treatment. They offer a 100% money back guarantee if you are not satisfied, so there is nothing to lose by trying this great product to get rid of your acne. UltraCalming SKINS is an acne control kit that will help you or your teen’s skin look clear, fresh and beautiful. The 4 step kit that is made with their own blend of extracts and plant ingredients make the products in this kit affordable as well as effective in fighting stubborn acne. There are 4 different products that are a part of this system. This formula has won numerous awards including the Mom’s Choice Awards, PTPA Parent tested, parent approved, National Parenting Center Seal of Approval and more. The all natural ingredients that are used in this acne treatment include lemon extract, orange extract, lilac stem cells, panthenol and others work to reduce redness, acne scarring, blemishes, pimples, discoloration and much more. There are no harsh chemicals, coloring or artificial fragrances either. UltraCalming SKINS does not use any of the harsh chemicals that other acne creams use. They promote a benzoyl free choice for getting rid of acne that works without stripping the oil from your skin, overdry, irritate or redden. They are also animal cruelty free and have no animal testing. This product prides itself on working just as well as the m ore expensive acne systems but you will spends a lot less money. Their formula has been proven to reduce inflammation by up to 75%, even skin tone, reduce acne by up to 58% and reduce oily skin by up to 72% after 30 days of use. It can be used by people with sensitive skin as well. Sulphate free cleanser – this gentle cleanser doesn’t irritate or over dry your skin while it removes all traces of makeup and exfoliates the skin. It will reduce redness as well. Rebalance Toner – This oil absorbing toner reduces your acne without drying or stripping the skin of important oils. It refines your pores, minimizing their appearance and using AHA and BHA in very lose does, keeps the skin clean. Cutting Edge, Oil Free Lotion – This lotion will treat and prevent the blemishes that are on your face while absorbing oil, hydrating and reducing the appearance of lines and wrinkles. It also removes the dead skin cells that can dull your skin. Repair Spot Treatment Serum – This antibacterial serum is an important antioxidant that brightens skin, reduces uneven skin tone, dark spots and blemishes and works to continuously repair the skin. The offer a 30 day challenge and will guarantee your satisfaction or your money back. This is a great kit to try if you prefer using products without the harsher chemicals. Oil of Olay is a well known name in products that create beautiful complexions in women of all ages. If you are struggling with an acne problem, you’ll be glad to know that Olay has a product that will work to clear your skin so you don’t have to deal with breakouts anymore. The Fresh Effects Clear Skin acne solution will immediately reduce the look of your acne. Acne Hater Deep Scrub – This product has 2% salicylic acid that attacks your blackheads and pimples during the cleansing process. Spot Zinger – This step also has 2% salicylic acid that gets rid of the blackheads, pimples and other blemishes as you keep using it. Results are noticeable within a few days. Swirled Mattifier – The Mattifier is made with powder that will reduce shine as well as redness. The Olay Fresh Effects Clear Skin Acne Treatment has an energizing scent of mint and citrus. It has been dermatogically tested, won’t clog your pores and is oil free as well. This system will clean, hydrate and attack your acne where it starts. Using this product will give you a beautiful complexion that will feel and look youthful and energized. Finding the perfect acne treatment for your needs is very important when you want to get rid of acne and other skin problems. There are so many different acne treatments on the market that are available that choosing one can be very confusing unless you know exactly what you are looking for. The three top rated acne treatment kits featured above are all excellent products that have all the necessary steps you need to get clearer, healthy skin. They are cost effective and more importantly all of them are clinically proven to work well to clear acne and provide the user with beautiful, clear skin. Continue reading below to learn more information on how to choose the right acne treatment for your needs. The following buyer’s guide will provide you with the right tools and knowledge to be able to easily sort through the different choices available and choose the one that will work the best for your skin type and problems. There are two basic types of acne. Below we have explained the differences to you so you will know which type you are dealing with and which products will work the best for your particular skin issues. Non-inflammatory Acne – This is the most common type of acne that most people will deal with. It can present itself as either blackheads or whiteheads. It will usually respond well to the over the counter treatments such as the three top rated we have reviewed. Non-inflammatory acne occurs when the bacteria, dirt and oil that have been trapped remains below the surface of the skin and forms a white spot. Blackheads are also common occurrences with non-inflammatory acne. The pores are filled with oil that becomes exposed to air through the open pores become discolored and turn dark. Inflammatory Acne – This is a much more serious form of acne that is very painful. It is serious and can cause continuing problems for the person suffering from it. What causes the inflammation that goes along with this type of acne is a response from the immune system that is responding to the buildup of toxins and bacteria. There are four different kinds of inflammatory acne. Papules – These form as light red blemishes, most often several in one area or another. There can be groups of light red papules in many different places on the skin. Pustules – This is another word for pimples. These can be quite inflamed and painful and are filled with pus. Many people squeeze pimples, especially when they have whiteheads, but it is not recommended to do this however tempting it is as it can cause scars. Nodules – A nodule is a large, swollen bump that is sore to the touch and can become quite painful. Cysts – This is the most serious and severe type of inflammatory acne. Cysts are large, pus-filled lesions that can get extremely large and can interfere with every day activities. Inflammatory acne doesn’t really do anything with over the counter remedies. If you are suffering from inflammatory acne you will need to see a dermatologist for treatment since you will more than likely need prescription medications. There are many different over the counter methods for treating acne. We have listed all the different choices you have for treating the problem. Spot Treatments – Spot treatments are designed to be put directly on the blemishes that are on the skin. It comes in many different forms including creams and gels. Many spot treatments contain Benzoyl Peroxide which will effectively dry up the spot. Sometimes this ingredient can cause redness, flaking and irritation, so it is not recommended to be used as an all over treatment. Face Lotion – Many people have acne that crops up in patches or that covers large expanses of the face or body. An acne lotion is created to be used on a regular basis not only to correct existing acne but to prevent future breakouts. One of the benefits that acne face lotion provides is ongoing pore clearing properties that keep the acne away. Medicated Pads – These are super simple to use, even for teens and are very popular over the counter treatments with people of all ages. Medicated pads are either towelettes or round pads that are in a container that has a medicated acne treatment of some kind. The pads are soaked in this liquid and you take them out one at a time and wipe it over the skin in the affected areas. The pads are not to be reused and are just disposed of when you are done wiping the affected area. There are two different kinds of medicated pads that deal with acne. One is a cleansing pad and the other is a treatment pad. The cleansing pad is used to remove dirt and oils from the skin and the treatment pad is used to tackle the acne specifically and get rid of the blemishes. Medicated pads can cause drying of the skin so it is not advisable to over use them or wipe areas that do not have blemishes. Acne Treatment Kits – If you have a lot of acne breakouts or you have large areas that are affected with acne, an acne treatment kit is just what you need. These acne kits have 3 or 4 steps that are designed to get rid of existing acne and prevent any further outbreaks. All of the products in the kit work together to provide the user with beautiful, blemish-free skin. There are many benefits to using an acne kit. They are usually very economical and also provide the user with the needed steps that they will need to do to keep their skin free from acne. Acne can be painful both physically and emotionally, especially for a teenager. The good news is that you don’t have to just accept having acne. Thanks to all of the treatment options on the market, there are plenty of things you can do to get rid of the existing acne you have and prevent any more from showing up. With all of the products on the market that help get rid of acne it may seem very confusing as to which ones you should choose. The information that is in this buyer’s guide is designed to help you understand the types of acne that are common, and the different treatments that are available to help get rid of the acne. The reviews of our top rated acne treatments are to provide you with detailed information about three that are at the top of the list for results, ingredients and customer satisfaction. When you have the right information you will be able to make the right decision for your type of acne and your skin’s issues.